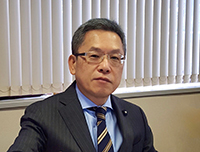 SATO DENKI COMPANY LTD. has consistently dedicated their effort in producing and selling electromagnetic steel sheet core even since the company founded in June 1947. The products we originally invented and manufactured,SA and SB type core, have become a standardized product for JIS (Japanese Industrial Standards,) we had a privilege to build a foundation for the core industry and are currently circulating our standardized products domestically as well as overseas. With the completion of the new Saitama factory in May 1994, being equipped with latest technology, we do our best to serve you in any way possible. We would be happy if we could receive your understanding, instruction and encouragement. Make contribution to the social development through the sales of high-performance and reliable electromagnetic steel sheet core. Comply with the rule of law and fulfill social responsibilities. We are continuously improving systems and introducing technological innovations to satisfy all aspects of production: quality, delivery date, and price. We will strive to improve quality by determining quality targets and aiming for sure achievement. We observe environmental-related laws, ordinances, guidelines, and agreements, and establish business rules to continuously improve our environmental management to strive to prevent environmental contamination. In the course of continuing our production, sales and business activities in harmony between people and nature, based on the principle that we cherish the global environment, we, all employees together, proactively engage in environmental preservation activities to fulfill our social responsibilities. This policy will be reviewed periodically and announced inside and outside the company to promote continuous improvement of our environmental management system. In order to determine environmental objectives and environmental goals and effectively realize environmental improvement, we promote environmental management with all employees. From receiving the mother coil to shipment, made fast and reliable by integrated management system. To view this page properly,please install the Adobe Reader. To view this page properly,please install the Flash Player. Copyright (C) SATO CORE All Rights Reserved.